Students will design and create a moving robot that is able to respond to and avoid objects in its environments using a variety of sensory inputs. iv. present the main findings from a range of sources, cited appropriately. During this phase of the Design Cycle, we are spending a lot of time learning by doing. We are using an iterative process, where we build something, test it out, then make modifications to improve it. We have learned a lot this way. It's a good idea to stop every now and then and reflect on what we have learned. That is what we are doing now. In today's class, we are taking the time to try to recall all of the things that we have learned over the past week and a bit with the LEGO Mindstorms Robotics kits. But we may be able to pick up a few things from doing some more specific research. There are many resources available online to help us better understand the principles of building stable structures that will help us build our robots. We can also find some resources to help us understand how to write more efficient programs. Here are some links to get you started. So, it seems that we focused our learning in two areas--building and programming. This will be reflected in our written work. You will write 2 entries in your blog about what you learned by doing and then you will write 2 entries in your blog about what you learned through your research. Now, you will create a new page on your Weebly called 'Introduction to Robotics: LEGO Mindstorms'. You can copy/paste the first few sections from this page to get you started. Include the title, situation, situation specific sections and the Inquiring and Analysing title and the four assessment criteria. 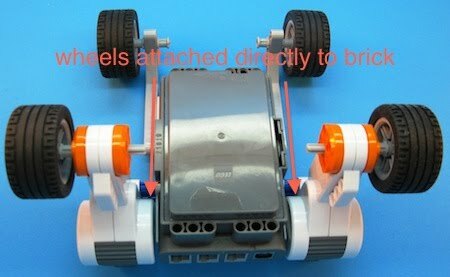 Write a couple of short paragraph that explain what principles that you learned so far that will help you build a robot that fulfuls these Design Specifications. This is a summary of the most important things that you learned from your research and experiments, applied to this task. What design elements did you learn about from your research and experience that you think will be of use? What principals of programming and of structure building do you think will be important as you build? Include some labeled images if you think it will help explain things more clearly. For example, when discussing construction techniques, you might highlight the importance of keeping your structure fairly simple. In the case below, attaching the motors directly to the NXT brick rather than to a frame keeps the robot strong while also keeping it simple. This will likely cut down on the number of things that could possibly go wrong. For example, when discussing programming concepts, you might mention the importance of conditional statements such as the case of a button press. If the button is pressed, one thing happens but if the button is not pressed, something else happens. 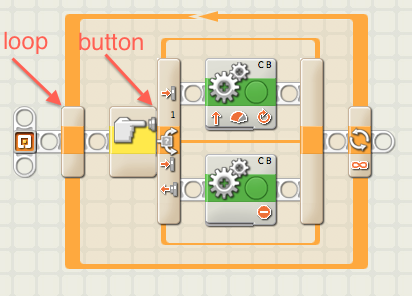 In the picture below, we see that the block for the button press is inside of a loop. A loop will check over and over to see if the button has been pressed. If the button block was not inside of a loop, it wouldn't work. Good artists copy. Great artists steal. In this section, we will look at other people's designs and look for good ideas that we can incorporate into our own robots. Complete an analysis of two or three designs that you have seen already (other people's robots, robots that you saw online etc...) that you think will help you make a good robot of your own. (try to include a few images here to help make it easier for the reader to understand.) Be sure to justify why you think that these design elements would be of use. You can do this in bullet points or a paragraph, Try to be succinct. Include labels on the pictures if you think it will help. 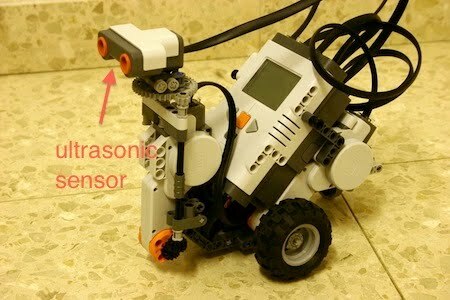 For example, when discussing the robot design in the picture below, you may want to highlight the use of the ultrasonic sensor on the front which can be used to detect obstacles. You may want to mention it's compact design. You may also want to point out that with the brick upright, it has a higher center of gravity and and narrow wheel base which might make it more likely to tip over. In this section, you will come up with a handful of design ideas (at least 3). You will sketch them on paper and include labels where necessary. For each design idea, you will include a short paragraph that explains the idea in more detail and offers some justification for the various design elements that you included. In this section, you will describe your final choice in detail. You will include a diagram that is clearly labeled that includes explanations and justifications for the various design elements. You will explain why this idea was the best one. This is where you put your final design drawing. You may choose to use the LEGO Designer software for this. iv. lists the changes made to the chosen design and the plan when making the solution. Be sure to take pictures and short video clips along the way. The idea is that someone else who is at least a little bit familiar with LEGO Mindstorms should be able to understand the steps and create a similar project based on your information. The target audience for your process journal should be next semester's class. They will get a chance to see your project pages before they begin their own. Be sure to include a section that explains and justifies and changes from your original design from the previous phase of the Design Cycle. It is OK to make changes. This is all part of the process. But be sure to explain what you changed and why you changed it. This is the evidence of learning that we are looking for in your written work. Come up with a name for your robot. Then put together a short (15-20 seconds) promo video to highlight its strengths and scare the competition. We will watch these videos before the main event! These videos will be part of the assessment for this phase, along with the things mentioned above. So be sure to show off all of the things you want me to see. Summarize your robot's performance both during the competition and from your own tests.. What worked? What didn't? Did it perform well during the competition? Why or why not? With a little more time, how would you change it? If you were going to built it again, what could you do to take it to the next level? To what extent does it fulfil the specifications that you set at the beginning? How close is it to your original design?